During the last year Acris Antibodies and OriGene Technologies discussed a possible co-operation in Europe. The result was that effective by September 2015 OriGene acquired Acris Antibodies to combine our strengths. Sphingosine-1-phosphate (S1P) receptors are divided into five subtypes: S1PR1, S1PR2, S1PR3, S1PR4 and S1PR5. The sphingosine-1-phosphate receptors regulate fundamental biological processes such as cell proliferation, angiogenesis, migration, cytoskeleton organization, endothelial cell chemotaxis, immune cell trafficking and mitogenesis. Sphingosine-1-phosphate receptors are also involved in immune-modulation and directly involved in suppression of innate immune responses from T cells. Acris Antibodies offers a broad selection of antibodies to Sphingosine-1-phosphate (S1P) receptors including 6 new exceptional monoclonals. All are validated at least in one or more applications. S- Adenosylmethionine is a common co-substrate involved in methyl group transfers. It is made from adenosine triphosphate (ATP) and methionine by methionineadenosyltransferase. Transmethylation, transsulfuration, and aminopropylation are the metabolic pathways that use SAM. Weak signal with your antibody? Try Signal Booster and Signal Booster Neo! 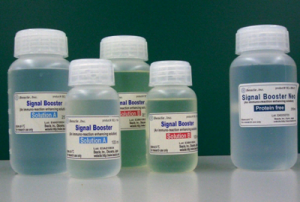 "Signal Booster series" are signal enhancement reagents for Western blot and ELISA.